The launch of Assassin’s Creed Origins on October 27 will be just the beginning for players who dive into the vast and mysterious open world of Ancient Egypt. 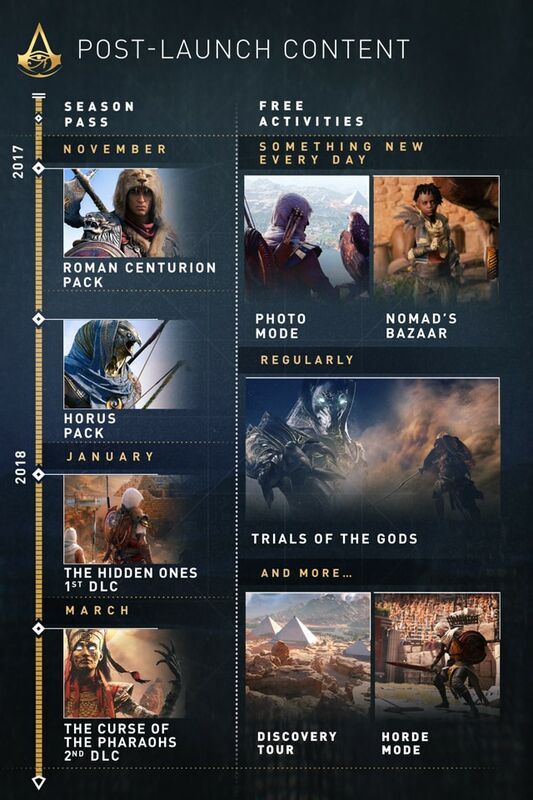 From expansions for Season Pass holders to free modes and more for all players, there will be plenty of new adventures for Bayek to explore. Get a glimpse of what’s in store in the trailer below, then read on for details. The Roman Centurion and Horus packs – These exclusive item packs will grant Season Pass holders a new outfit, weapons, shield, and mount when they become available in November of this year. The Trial of the Gods – Face off against the Egyptian gods in boss battles during special timed events, and receive valuable rewards for victory. The Nomad’s Bazaar – Track down a wandering merchant who will give you daily quests to pursue and reward you with exotic mystery rewards. Photo Mode – Capture the beauty of the Egyptian landscape and indulge your inner wildlife photographer. Horde Mode – Hone your skills with blade and bow in the Gladiator Arena. The season pass is included with the Gold edition. Assassin’s Creed Origins will be available on October 27 for PS4, Xbox One, and PC. For more on the vibrant open world and the new combat system, check out our previous coverage.